The Bureau of Land Management's methane venting and flaring rule has spent its entire existence in the courtroom. Oil and gas drillers sued BLM the day the rule was finalized, and litigation hasn't seemed to slow down since then. Over the past year, the Trump administration's multiple efforts to undo the Obama rule have triggered more court battles and subsequent appeals. Some cases have been resolved while others are still live in the courtroom, at times becoming entangled with one another. The result is a knot of methane cases that are both highly consequential and increasingly difficult to keep straight. 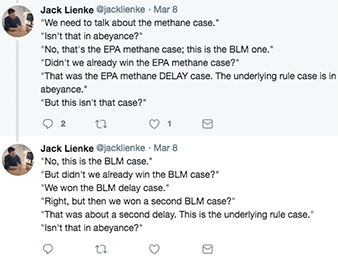 "Oh good, another methane case," Jack Lienke, regulatory policy director at New York University's Institute for Policy Integrity, joked on Twitter in March. "A fun game we play at Policy Integrity staff meetings is to have one person say something about 'the methane case' and then let everyone else spend 20 mins trying to figure out WHICH methane case the first person is talking about. Try it at home!" Why are there so many cases? What does each case cover? Wyoming district court: This is the original lawsuit over the Obama administration's methane rule, and it's still making news. Two industry groups and several Western states sued BLM in the U.S. District Court for the District of Wyoming when it finalized the methane rule in 2016. They argued that the standards exceeded the agency's authority because they effectively regulated air quality, which falls under the jurisdiction of EPA, states and tribes. Plus, they said, the rule is expensive for drillers and doesn't acknowledge strides they've already made in cutting methane emissions (Greenwire, Nov. 15, 2016). The court didn't rule on the merits of the case before the Trump administration began working to unwind the regulation, but industry and state lawyers sought help earlier this year when a California judge revived the full Obama standards. They asked the Wyoming court to find that the key provisions of the underlying regulation should be stayed. The judge still didn't rule on the merits of the rule, but he agreed last month to block the revived provisions to preserve the "status quo" (E&E News PM, April 4). 10th Circuit: Supporters of the methane rule were not on board with the Wyoming court's decision to block implementation of the revived standards. They're appealing in the 10th U.S. Circuit Court of Appeals. They've asked the appeals court to immediately reinstate the full regulation while it reviews whether the Wyoming judge made the right call. Both sides are filing briefs on the issue this month (Energywire, April 6). California district court: This was the Trump administration's first legal defeat on efforts to sideline the methane rule. 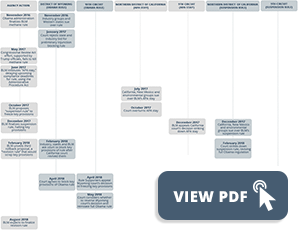 BLM used a provision of the Administrative Procedure Act in June 2017 to delay upcoming compliance dates for the rule. The U.S. District Court for the Northern District of California rejected the "APA stay," finding that BLM was "only considering one side of the equation" — relief to the oil and gas industry (Energywire, Oct. 5, 2017). 9th Circuit: The Trump administration appealed the first California decision to the 9th U.S. Circuit Court of Appeals late last year, but the case was short-lived. Focused on other plans to ditch the Obama standards, BLM dropped the appeal in March (Energywire, Dec. 5, 2017). California district court: BLM's second attempt to neutralize the standards came in the form of a "suspension rule" — which went through the standard public notice and comment process — that delayed significant parts of the Obama rule for a year. The delay quickly landed back in the Northern California federal court, which issued a harsh rebuke to BLM in February, saying its plan was "untethered to evidence" (Energywire, Feb. 23). 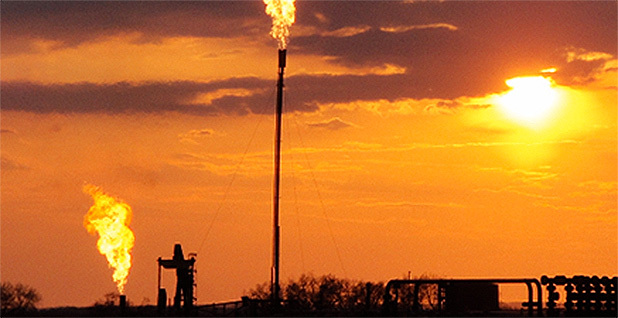 The consequences of the ruling were huge, reviving the full Obama methane rule. That revival was short-lived, however, as the Wyoming judge then blocked implementation. 9th Circuit: This is the latest outgrowth of the legal tangle over the methane rule. Though Trump officials said little about the California court's February decision at the time, they filed a notice of appeal last month. The case is in its very early stages (Energywire, April 24). BLM: BLM and the Interior Department have been lead litigants on both sides of the debate over the methane rule. When President Obama was still in office, government lawyers defended the regulation and successfully fought off an industry and state bid to stall it. The Trump administration has since moved to delay and rewrite parts of the standards. BLM's lawyers are now busy fighting legal challenges to those efforts. States: Texas, North Dakota, Wyoming and Montana have been active in various stages of litigation opposing the Obama rule. They're most concerned about jurisdictional issues, arguing that the methane rule is effectively an air quality measure that treads on the regulatory turf of EPA, states and tribes. On the other side of the litigation are California and New Mexico. They support the original regulation and have pushed to keep it in place. Industry: The Western Energy Alliance and Independent Petroleum Association of America have led the legal battle against BLM's rule since Day 1. They say the rule is too costly and doesn't credit drillers for the work they've already done to slash emissions in recent years. The American Petroleum Institute has also gotten involved in some phases of the litigation, making similar claims. Environmental groups: Environmentalists were plotting to defend the 2016 rule before it was even finalized. After industry groups filed suit, they quickly mobilized to intervene in the case on the Obama administration's side. When the Trump administration launched efforts to dismantle the standards, environmentalists led the legal battle to save it. They have teamed up with California and New Mexico to defend the rule in several rounds of litigation. What's the current status of the rule? A few parts of the Obama administration's methane rule that never faced much pushback remain in effect. Those include tight restrictions on methane venting and liquids unloading. But the key provisions that have driven much of the legal pingpong — requirements for leak detection and repair, for example — are not in effect today. The California court's February order striking down BLM's suspension of those standards had the effect of reinstating the full Obama rule, but the Wyoming court subsequently decided to block implementation. Those decisions are facing appeals in the 9th and 10th circuit courts, respectively. A decision from the 10th Circuit is expected fairly soon on whether to immediately reinstate the rule. Meanwhile, the Trump administration is working on a broader "revision rule" that guts many contested parts of the Obama regulation. Those revisions are expected to be finalized in August. And then? A new round of litigation. Doesn't EPA have a methane rule, too? Where does that stand? That's a whole other can of worms. Yes, EPA unveiled its own methane standards during the Obama administration. While the BLM rule focuses on oil and gas wells on public and tribal lands, the EPA rule targets emissions from any new sites across the country. EPA also had a taste of legal drama over its methane rule. States and industry sued the Obama administration for issuing it, and then other states and environmentalists sued the Trump administration for delaying it. The environmentalist-state coalition won that case last summer, and the EPA methane rule for new sources is in full force. The agency is working on a rollback plan.